In 1908, FDNY's 52nd Bn was formed with Engines 172 (E 272), 173 (E 273), 174 (E 274); Hose Companies 8 (E 296) and 9 (E 297); and H&L Companies 79 (L 129) and 80 (L 130). All companies were organized in former volunteer company firehouses. 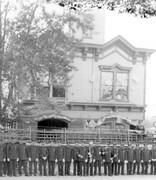 In 1918, the 125th St firehouse was rebuilt for Engine 296. 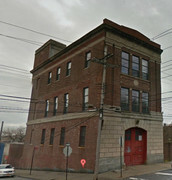 College Point: FDNY Ladder 80 (became Ladder 130) at 18-18 125th Street firehouse with FDNY Hose 8 (became Engine 296). - Ladder 130 and Hose 8 were apparently combined to form Combined Engine Company 130 for a period of time between 1913 and 1918. The house watch desk was located directly behind where the apparatus doors are folded back. Behind the house watch there were two side by side sliding poles from the second floor. After 296 was disbanded in 1960 and before the Communications line men moved in there was a firefighter detailed there from all over the battalion 24/7 to keep the steam boiler operating. This of course was in the colder months to keep the water pipes from bursting. It was an interesting house to wander through although it needed a heck of a lot in the way of repairs. There is a piece of baseball history associated with this firehouse. Bobby Thompson, the baseball player who hit the famous "Shot Heard Around the World" home run to win the 1951 pennant for the NY Giants, lived on Staten Island. He went to this firehouse to celebrate immediately after he won the NL championship at the Polo Grounds. The walk off home run, one of the most famous in baseball, won the third game of a rare NL pennant playoffs (no playoff system back then). The Giants, were down 13 1/2 games in August and were trailing 4-1 in the 9th inning. It became the "Miracle of Coogan's Bluff." After he hit the walk off home run, Thompson took the SI ferry to celebrate with his brother Jim, who was on duty with E154. 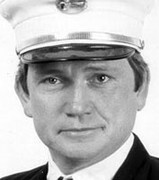 Jim Thompson's son, Jimmy, also became an FDNY captain. Engine 154 protects a large area of western SI. It is first due in the Travis and Bulls Head sections of SI. Travis was originally called Linoleumville - the site of America's first linoleum factory in the 1860s. It was the location of a ferry to NJ at the end of Victory Blvd. The area was renamed Travis in 1930 after an original area settler. Lt. Frank Pellegrino is a fellow musician who I've worked on DooWop shows with. He played tenor sax for Reperratta and the Del-Rons. Last time I saw him was a few years back, when he was promoted to Captain of E91 in "El Barrio". Not trying to change the thread, but regarding "Reparata" aka Mary Alese, they had a few great tunes back in the 60's i.e. "Whenever a teenager cries", "I can hear the rain", "Tommy" and others. Natalie Wood's character's house in Splendor in the Grass (1961) was at the southeast corner of Victory Boulevard and Roswell Avenue, less than a mile west of Engine 154's quarters. It's now an empty lot. Ken - Natalie Wood is not here any more either. Too bad. I always liked Travis neighborhood. A lot of older classic homes. Friendly small shops. The house she lived in for movie scenes was on top of a small store I think? Too bad it is gone. Victory Blvd used to be a toll road in the 1800s. Called Richmond Turnpike. It was renamed Victory Blvd to celebrate the end of World War I. Volunteer fire company Oceanic Hook and Ladder 1 has been operating from its Travis firehouse since 1800s. Last I knew they operated an engine and brush fire rig. Before E 166/L 86 firehouse and E 154 firehouse were built, Oceanic H&L was the only fire company close for Travis and Bulls Head. E 163 L 83 and E 158 had very long runs. Oceanic H&L 1 and Richmond Engine 1 are two of the last operating volunteer fire companies in NYC. NOTE - THREAD CLOSED DUE TO SITE SPACE - CONTINUES IN "FDNY AND NYC FIREHOUSES SECTION 2"